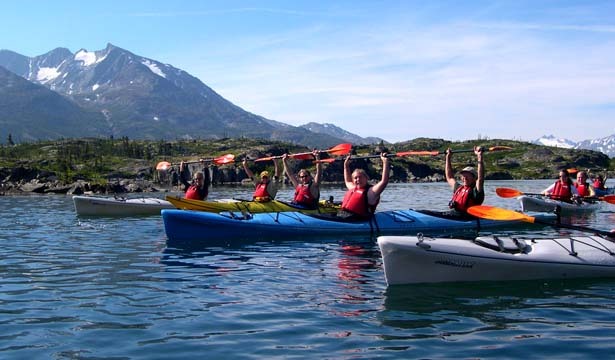 This tour offers the best of both worlds - You and your family can enjoy the breathtaking scenery of the White Pass & Yukon Route train ride, and a breathtaking kayak excursion through some of the most spectacular scenery you'll see on your entire cruise. The fully narrated train ride will immerse you in the stunning landscape of Skagway and The White Pass, taking you all the way to Fraser, British Columbia, where you will get equipped for your kayak trip. You will then kayak in Fraser Lake, a glacially-carved masterpiece framed by towering mountains and roaming wildlife. You will then return to Skagway along the famed Klondike Highway, voted one of the top 5 most scenic highways in the world. Passport is required. Some nationalities will need VISAs to enter Canada. You may take the train to or from Fraser, depending on the time of day you enjoy the tour. A light snack is provided. A jacket is highly recommended as temperatures on the lake can be colder than in Skagway.